The city of Edgewood is located in western Washington at the northern edge of Pierce County. It is situated east of Tacoma, south of Federal Way and Auburn, and north of Puyallup. 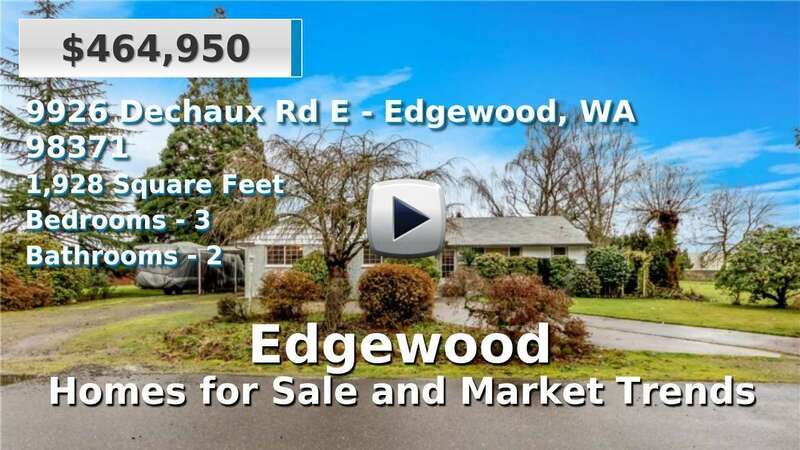 Edgewood is part of the Puget Sound region, though it is several miles inland of the Port of Tacoma. It's a relatively small city with just under 10,000 residents, and neighborhoods are largely suburban. Edgewood has recently seen an increase in newly constructed homes, providing home buyers with a nice balance between well-established and newer single-family homes for sale. An average commute here is about 27 minutes. 4 Beds | 2 Baths | 2132 sq. Ft.
4 Beds | 2.5 Baths | 4068 sq. Ft.
3 Beds | 2 Baths | 1845 sq. Ft.
4 Beds | 3.25 Baths | 5703 sq. Ft.
4 Beds | 2.5 Baths | 3238 sq. Ft.
4 Beds | 4 Baths | 5558 sq. Ft.
4 Beds | 2.5 Baths | 2633 sq. Ft.
3 Beds | 2.5 Baths | 2770 sq. Ft.
3 Beds | 1.5 Baths | 2644 sq. Ft.
3 Beds | 2.25 Baths | 1950 sq. Ft.
4 Beds | 2.5 Baths | 2821 sq. Ft.
2 Beds | 1.5 Baths | 1530 sq. Ft.
3 Beds | 2.5 Baths | 2305 sq. Ft.
4 Beds | 3.25 Baths | 2813 sq. Ft.
5 Beds | 3.5 Baths | 3350 sq. Ft.
4 Beds | 2 Baths | 2218 sq. Ft.
4 Beds | 2.5 Baths | 3236 sq. Ft.
5 Beds | 4.25 Baths | 3416 sq. Ft.